Qatar Airways offers non-stop flights between Malaga airport and Doha during the summer. A low-cost flight offering connections between Asia and the Costa del Sol. In 2019 flights from Doha to Malaga will be from 29 May to 29 September. The last flight from Malaga will depart to Doha on 29 September and the first one also on 29 May. If you are in Malaga planning a trip, then the last departing flight will be the 26th September instead. The direct link between Qatar and the Costa del Sol enjoyed great popularity last year, triggering the arrival of Asian travellers of great purchasing power. It also made it easier for people who were looking to connect with destinations in the Far East from Malaga. The popularity achieved by this airline over the past year has caused it not only to consider repeating, but also to increase the logistical capacity of Qatar Airways in Malaga for flights with Hamad International Airport. The 4 weekly flights the past year will be increased to 5 from Hamad airport. Weekly flights will depart on Mondays, Wednesdays, Fridays, Saturdays and Sundays at 1.30 am. Do you plan to travel from or to Malaga this summer? Then you might be interested to know more details about this flight. The plane used during its premiere in Malaga was a Boeing 787 Dreamliner, a modern and comfortable aircraft that I had the opportunity to try with a total capacity of 254 passengers, 22 business class and 232 economy class. The aircraft in 2019 is a Boeing 777 that offers almost double the capacity for business class passengers and a significant expansion of passengers in economy class. It offers a total of 358 passenger seats, 42 business class seats and 316 economy class seats. It is an equally comfortable airplane that I was also able to test on my connection. Both planes are a good choice for the passenger. This change attends to increase in demand for the flight between Malaga and Doha. A curious detail is that the Dreamliner does not have the typical sunblind in the window, but with a button we can darken it or leave it transparent. Ideal for children, mine loved it. It is a flight of approximately 7 hours, direct and with services of food and drink. Recommended seats? Except for rows 10 and 18, or seat 20D, there are no special recommendations when choosing a seat. I would try to avoid the last row 43 as well as the middle row 42 and row 17 because of the lack of reclining in the seats. I would also avoid seats 12A, 12K, 4A and 4K for lack of window. This time I had the luck to seat on the front seats so I had plenty of space for my legs. The approximate legroom is 79 cm, which is typical for most airlines. There is a WIFI pass for payment. The first 15 minutes are free for messaging use. Plug and USB in seating. On-demand video, movies, audio and games for kids with Oryx One. Photo taken during my flight. I usually travel to Indonesia using Turkish Airlines because it was cheaper and faster than others until Qatar Airways. I tell you positive and some less positive points that I could find. Hamad International Airport is one of the easiest and fastest airports to travel through. It had a stop of less than an hour and I had plenty of time to reach my boarding gate. The airport has games for children near some boarding gates, very good cleaning and a smoking area with seats. The ticket price is significantly lower than other options, which is always positive. As a less positive point I can say that the contact from the website is very slow and ineffective. On the other hand, the support from Twitter is effective, fast and highly recommended. The entertainment system is very good and I value it positively. 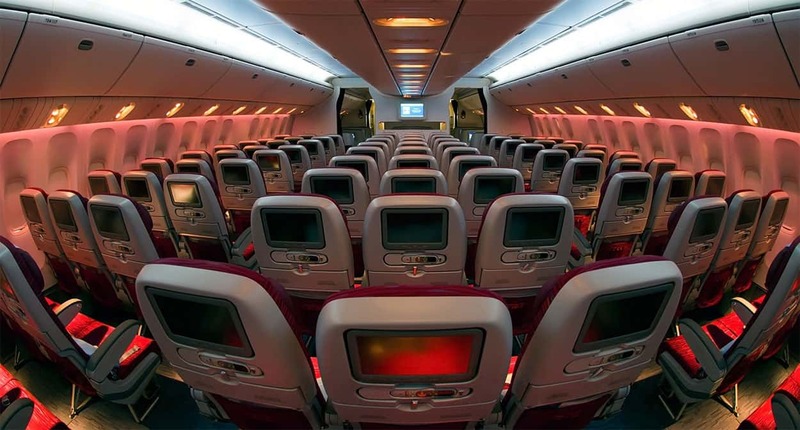 With many new and popular movies, the flight will become more enjoyable. The food on the flight is of good quality and the assistance from the staff is flawless. They should offer this flight during all the year. The prices for a round-trip ticket are competitive, even more if we consider it is a direct flight instead with stops like with other airlines. Business Class: Price is around 4700€ (5400$) for a round trip (from 2400€ when departing from Malaga). Economy Class: Price is around 1100€ (1264$) for a round trip (from 413€ when departing from Malaga). The prices shown are indicative and are likely to change according to demand. While waiting I had time to take a photo of an aircraft at Doha airport. Please note the following data, which may vary as I have taken them at the time of writing this article. Approximate duration of the flight: 7 hours . Have you had any experience that you would like to share with us about flying with Qatar Airways to or from Malaga airport? Previous Previous post: Marbella 4 Days Walking in October 2019 – Hiking and fun for all ages!